Welcome to my little 'giveaway' to coincide with our Australia's Biggest Morning Tea Auction. The auction will commence over at Tout Mon Amour on Tuesday 22 May at 9am with final bids ending at 9pm on Thursday 24 May 2012. Please pop over and browse the lovely items up for auction with 100% of money raised going to the Cancer Council Qld. A huge thank you to the very generous businesses that have donated items to the auction. 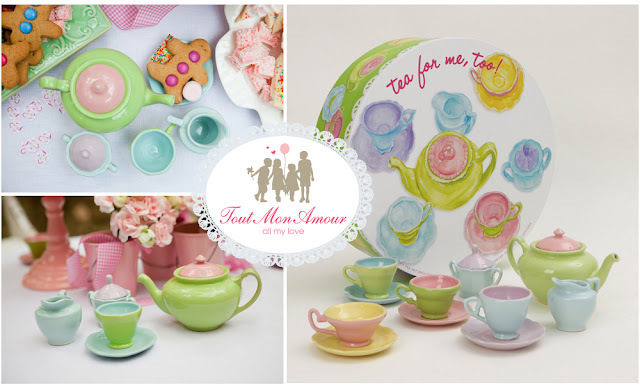 I am giving away one of these very gorgeous and very stylish 'Tea For Me Too' child's tea sets by Rosanna. Made of sturdy stoneware and microwave and dishwasher safe, these retail in my store for $119.00. How cute is it!! The giveaway commences now and ends on Wednesday 30 May at 2pm Qld time. And this is how you can enter to win!! 1. To gain 2 entries share the auction and this giveaway with your friends and family. To do so click here and 'public share'. (to public share select share and then choose the public option to ensure I can see it). In your status type 'Tout Mon Amour is giving away this gorgeous 'Tea For Me Too' child's teaset' pop over to their page to enter!!'. Once you have done so scroll down to the bottom of this post to the Rafflecopter application and click on the very first entry (link) at the top titled 'Share The Auction & Giveaway'. Click done. (Note; the instructions on how to share will also be revealed again). I will check that you have shared so please don't click 'done' unless you have done so. 2. To gain extra entries (again via Rafflecopter below) you will find the links to the Facebook pages of all of our generous donating businesses. For every 1 you 'like' on Facebook you will receive 1 entry. Note: As we have so many donating businesses, it is NOT mandatory to 'like' all of them....but the more you like the more chance you have to win!! Now for a couple of basic rules...only residents of Australia can enter. The prize will be shipped (free of charge) within Australia only. The winner will need to provide Tout Mon Amour with a scanned/emailed or faxed copy of a photo ID. The name shown on the ID MUST match the one you have entered the competition in. ie. your Facebook name must match the one on your licence or other form of photo identification. If you cannot provide, (or are not willing to do so) a photo ID please do not enter. This ensures that all entrants can enter once under their legitimate legal name. If the winner cannot provide this they will forfeit the prize and another name will be drawn at random. Only entrants aged 18 years and older are eligible to enter. Woo hoo - how exciting! Definitely brings back memories of my little tea set! Thanks for the opporunity to win your awesome little teaset! I hope I've entered and shared properly! Nicole Dugo -Thankyou done :-) I would love to win this for my 2 little girls! OOOH how exciting and what an easy way to like lots of new pages... now I have some exploring to do! Very excited - would love this for my little girl!! Good luck everyone! And all for a wonderful cause. All shared - so much to see!!! liked all & shared the Love too! OMG that took awhile lol what wonderful pages!! Liked and shared! A gorgeous giveaway for 1 lucky person. Beautiful pages from many talented people. Lovely, Shared, Liked and showed some LOVE!!! Love your work Amanda! I believe there is more than 1 winner!